Oooo, Heavenly's a place on Earth! This is the always difficult "follow-up" album, but Tomoko needn't have had to worry. Not only is Heavy Starry Heavenly leagues better than its predecessor, it also has some truly stand-out moments that make it worth listening to time and time again. Also, before we begin, I must mention that each and every song on this album ends properly, as there are no fade-outs. I hate fade-outs. This song is a very strong start to the album. It immediately puts this album on heavier footing than the first, yet with a much greater focus on melody. That beautiful chorus sends shivers down my spine. If I had to pick one complaint, it's that the vocals are more liberally auto-tuned, but that just feels like nitpicking. The quieter breakdown leads into an awesome one-time section where you can really feel the darker tone of the album. This track is basically like Tomoko saying, "THIS is Heavenly6, how it was meant to be." And I like this solidity and determination, it starts the album off right. The punk sound from the first album returns with a vengeance. Don't worry, though! This time it channels Tomoko's strengths instead of just trying to be a different sound to February6. I'm sure we haven't forgotten how Heavenly6 tried to shove the style change down our throats. Not only does it "rock", but this song also benefits from a steady, fast BPM. The final chorus closes off the track sufficiently. This is one of my favourites just on account of how alive it feels. She sings about someone "coming in her mind", but that wasn't the place I was thinking of personally. Opening like none other so far across any Tomoko project, the song is flung into the verse. It is sung with an attempted dark-sounding voice which just comes across as cute, which is a failure for Tomoko. The chorus is pleasant enough, but as a whole I feel no need to further criticise the song in any capacity. The basic horror premise falls flat on its face and the song suffers as a result, but it isn't terrible. It is certainly a grower, because I am really digging it after multiple listens. It begins with an awesome bass-line... and continues that way until the first chorus. That is kind of refreshing. The chorus is only mildly interesting, making this song predominantly uneventful. The breakdown is different enough to deserve a quick mention but yeah, definitely not a show-stopper. Heavy start, then bleeds into a melancholic sounding verse yet with an uplifting pace. This is truly a mix of feels. The chorus shakes up proceedings by meandering and swerving in unusual directions. There is even a short, "cheerleady" stab near the end of the song. While it errs on the border of being memorable, this song is not to be trodden on, despite its name. Upon further listening, I can hear the fun that must have been had recording this song; I feel that comes through quite clearly. I was dreading having to talk about this one. However, when I listened to it and realized this album version of the song, I relaxed. This cut focuses on the good parts and strips out the preamble. The things I dislike about this song stem entirely from the single version, which has long-winded and boring sequences with a fairytale-like sound and seriously out of place macabre music-box crap-sounding twinkling. This version of the song is missing all of it and is all the greater for its absence. This version is missing all of the progression, which actually makes it immensely better. See? Less can be more. REALLY pleasantly surprised. That chorus and ending are exceptional. Crazy how the worst single becomes awesome just by slicing out the crappy parts, and the existence of this cut confirms that someone at the studio shares my opinion. Ends beautifully with a moody and creepy finale. Starts with Tomoko stubbing her toe or something. This is a rough sounding song with a very unusual chorus, musically fascinating but difficult to follow. Not a toe-tapper and not a personal favourite. The song remains peculiar in construction until the end, which thankfully comes quickly, but I mean, well, it is memorable enough. Mellow, laid back and ballad-y. It is a pleasant rest from the last few heavy songs. No "Lost My Pieces" beater, but it does win personal awards for being inoffensive to my ears so there's that I guess. The tacked on Crossmas number. Not a terrible song, but barely contains a single festive staple. No sleigh bells, twinkles or brass instruments. It is less Merry Christmas and more Christmas Alone in the Attic, though that is hardly a complaint if I could snuggle with Tomoko on a cold winter's day. This song was probably used to ensure album sales during the festive period. This is the song that introduced me to Tomoko Kawase and her many works. Gee, thanks, anime. This song is infectious, and after hearing it twenty plus times on the introduction to "What-If Edo Was Invaded by Aliens and They Brought Future Technology with Them" series "Gintama", it is programmed to be my favourite of all her works. The verses are fast and strong, the bridges are sweet, the choruses are tight, and the whole song is befitting of the name Heavenly. The lyrics are very memorable, despite being mostly in Japanese. This cannot be my choice cut simply because I have already been so unfairly subjected to it, it just wouldn't feel right picking it, but it really is the strongest and best on the album and endlessly listenable. Starts with just vocals and bass, but morphs into an intriguing song that really shows yet another sound that Tomoko is capable of achieving. This song is worth more than just one listen, if only for that wonderful guitar solo. Some rather interesting lyrics... Tomoko says she won't kiss someone's "arse"; that's okay, not into that either. Closing off the album is this safe, "punky" number that sounds like it could have been on the first album. The song is really pleasant, uplifting and calming. This is the most fun song on the album and a smooth way of closing it. Tomoko says she thinks of me always; the feeling's mutual. 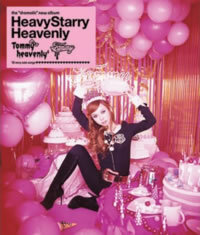 Heavy Starry Heavenly is superb. You need this album in your collection. That is all I have left to say.